The most cost effective cask on the market. A new development for the Real Ale Industry, Global Polymer Solutions brings you a range of lightweight casks using a registered design that fulfils all industry requirements. Each cask is individually numbered giving absolute traceability. The future in keg manufacturing is here. GreenKeg is a lightweight, environmentally friendly, sensibly priced range HDPE kegs using a new, patent protected design. 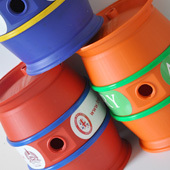 Kegs are available in custom colours with unique branding opportunities. Global Polymer Solutions has been formed giving over 35 years of experience within the plastic manufacturing and brewing industries which gives it a unique insight, together with a vast knowledge of the brewing and plastic manufacturing industry. Responding to the market need for a suitable replacement to the Stainless Steel Keg and Cask, Global Polymer Solutions has formed strategic alliances with a number of the UK's major brewers which has enabled it to carry out a comprehensive testing and proving program.